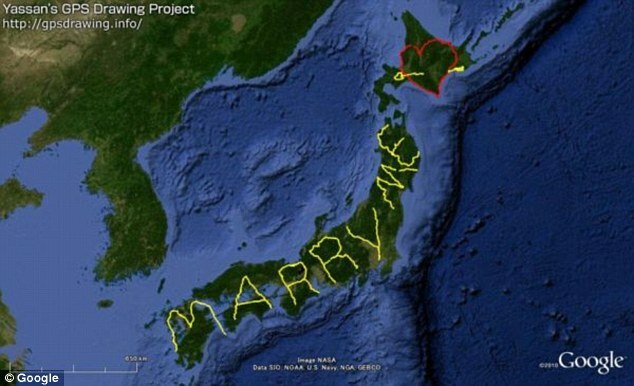 It was the proposal heard around the world thanks to GPS tracking technology. Japanese artist Yasushi Takahashi quit his job in 2008 to embark on his now-famous journey across Japan to create the unique proposal. Over the course of six months, Takahashi covered almost 4,500 miles, mostly on foot, but sometimes by bicycle, ferry, or car. He used a GPS tracking system to track his every move from Hokkaido Island to Kyushu Island where his journey ended. He wanted to experience his country, but also create a special proposal for his girlfriend. Takahashi also made a seven-minute video about his journey to accompany the proposal. His trek is the world’s largest marriage proposal and holds the title of the world’s biggest GPS drawing in the Guinness World Record Book. It took 6 months, but it was worth it–she said yes.